I don’t know why, but Süleymaniye Camii always seemed unattainable to me. Proudly perched on one of the city’s Seven Hills overlooking my beloved Eminönü, the mosque always seemed to mock me. A view of Süleymaniye Camii from the Golden Horn. Finally, in the last weeks leading up to our move, we made a bucket list of things remaining to do in Istanbul. Visiting the Süleymaniye Camii was a priority on our list. (Seeing the Seaviews from the Sağır Han also made the list.) That someday was now. The view of Süleymaniye Camii as seen from Atatürk Bulvarı. Instead of trekking through the backstreets of Eminönü or coming from the Grand Bazaar, we took a public bus to the Valens Aqueduct. For whatever reason, we thought it would be easier to approach from this direction. Plus, I got some good photos of this Roman aqueduct that used to serve the citizens of Constantinople. After a 10-minute walk through some dusty city streets, we finally reached Süleymaniye Camii, which was finished in 1557, designed by the Ottoman Empire’s greatest architect, Mimar Sinan, and named after Sultan Süleyman the Magnificent. The mosque dominates the city’s Third Hill and overlooks the Golden Horn. You even have seaviews from the Bosphorus to the Asian side. How had I missed this grand mosque? Unfortunately, we timed our visit just before the afternoon call to prayer. We didn’t have much time to admire the interior’s detailed, painted dome and colorful, stained glass windows. The mosque underwent extensive restorations, costing 21 million TL, between 2008-2010. Still, it’s difficult not to immediately be wowed by Sinan’s masterpiece. The mosque is beautiful. Outside the mosque, we watched as Turks performed their washing ablutions and then strolled around the peaceful grounds. You easily could spend an hour in this area. Nearby is Sinan’s tomb as well. After taking all the photos I wanted, we continued to stroll down towards Vefa so my husband could try Turkish boza for the first time. Let's just say that I like the fermented drink better than he does. We also found a quaint, second-hand bookstore called Labirent Kitap Evi that’s worth a stop. Now, I think that visiting the Süleymaniye Camii and drinking boza should be on everyone’s to-do list in Istanbul. You can walk from the Grand Bazaar to here; or, take any of the public buses from Taksim, Eminönü or Karaköy that are heading to Unkapanı. The mosque is open every day for free, but donations are suggested. Be sure to heed the call to prayer times which you can find here. Islamic architecture has been a big, emotional thing with me since I saw my first picture of Alhambra when I was about 13. I recall clearly my first visit to Süleymaniye about 10 years ago - sitting with my back to one of the pillars, camera useless due to overly moist eyes as I gazed at the perfection that is this magnificent construction. Boza came later and may not be in the same league, nonetheless it too is a magnificent 'construction'! @Alan, Thanks for sharing such a wonderful memory! I think it's amazing that these beautiful structures are still standing nearly 500 (and sometimes more) years! Gorgeous photos, stunning post Joy! 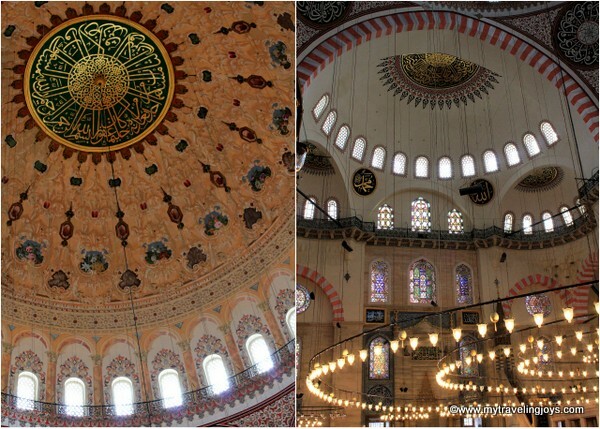 Suleymaniye is a truly magnificent mosque, loved your photos! what a gorgeous mosque! are you back for a visit? I finally got to visit Suleimaniye on my third visit, since it was undergoing renovations. I did get to see the tombs next door, though, on my first visit and now THEY are closed for renovations. Worth the climb. I asked a guard in my elementary Turkish "Turbe Mimar Sinan nerede?" and visited that as well. To me, Sinan is the Turkish Leonardo: simply a genius. @Joyce, Nope. I've got hundreds of photos from Turkey that I would still like to share with you all. Slowly, I'll mix in Turkish posts with the Polish ones. @Mary, Something is ALWAYS under renovation/restoration work in Istanbul! :-) I'm happy we at least got to see this mosque. Glad you got to see it. It is kinda nestled in the back and other things take the first priority on the list for sightseeing. Wow, didn't realise the mosque had proved so elusive for you Joy. The first time we went I remember asking lots of people...and we were stood right next to the perimeter walls. People were just pointing at the walls. :) Great pics. @Ilke, No more restaurants right on the grounds, but plenty outside the walls. We ate at one where the daily special was a kind of kofte served with a potato/carrot stew of sorts. Delicious! @Julia, I know. Kinda strange, since I've trekked all over the city. Thanks! I had a wonderful time in Turkey especially in Istanbul too when I visited it last month. Most of my shopping was done in Emimonou(spelling incorrect :-)). I visited Sarkel for chocolate chips and it was such a shocker that the street was sooo crowded. Reminded me of Mumbai's Crawford Market so was quite comfortable wading my way through. Thanks for your tips since it has helped ease my experience in Istanbul. 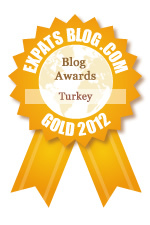 @Bergamot, Happy to hear you enjoyed Istanbul so much, and in particular, Emimonou as you said. ;-)I could spend hours wandering around here. Good things often come to those who continue to try, once the goal is sensible.